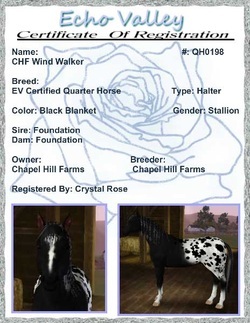 Walker is a black Quarter Horse stallion with a white blanket and spots, and he has been a favorite of breeders. He is flashy, and he knows it! He has a nice small head, and he has thrown it on many of his foals. I can always tell it is a Walker foal, by their small refined head. Walker is a high strung horse who thinks fast, so you need to keep one step ahead of him. He is agile, friendly and a genius.